A developer has been appointed for the £11m overhaul of a train station which will help channel visitors to the 2014 Commonwealth Games in Glasgow. Network Rail has appointed C Spencer Ltd to transform Dalmarnock station in the city's east end. 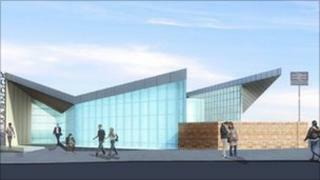 Preliminary work is under way, with completion expected by autumn 2013. The station is close to the athlete's village and key venues such as Celtic Park, the National Indoor Sports Arena and Sir Chris Hoy Velodrome. The contract includes the delivery of a new station building, relocated to Dalmarnock Road from Swanston Street. There will be lift access to both platforms, a new pedestrian footbridge, new platform surfaces, new wall cladding on each platform, and new passenger information and communication systems. David Simpson, Network Rail route managing director for Scotland, said: "We are confident that we can deliver the new station on-time and within budget and that it will provide visitors with a first-class welcome to the local area, during the Commonwealth Games and beyond." Transport Minister Keith Brown added: "The new-look station and transport hub will not only play a vital role during the 2014 Commonwealth Games, but will also a key part of the regeneration of the east end of Glasgow long after." Network Rail is delivering the project on behalf of Transport Scotland and other funding partners - Strathclyde Partnership for Transport, Clyde Gateway, Glasgow City Council and the European Regional Development Fund.